But when the mass tripled in size, she demanded a biopsy which revealed stage three cancer, inspiring her to trail blaze a program to help young women advocate for themselves – and to teach doctors to listen. 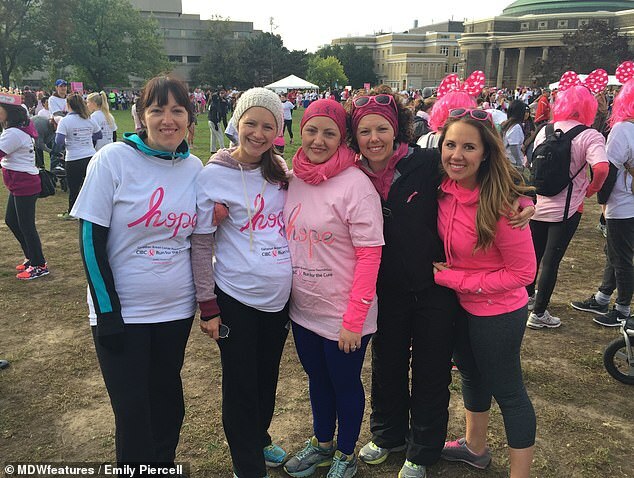 Programs coordinator at Rethink Breast Cancer, Emily Piercell – now 31 – from Ontario, Canada, was an aspiring lawyer before cancer turned her world upside down. Breast cancer is relatively rare in young people, but it happens – to 70,000 men and women between 15 and 39 each year in the US. 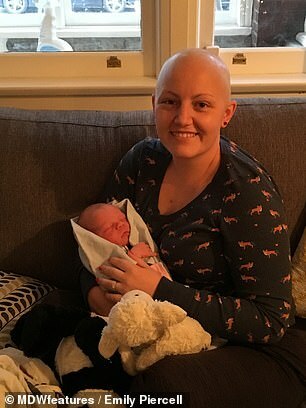 Emily’s doctor wasn’t concerned by the lump because she had no family history of breast cancer and she was only 27 at the time. Emily was sent for an ultrasound and doctors concluded that the lump was dense tissue and nothing of concern, so they didn’t do a biopsy. Over the next three months, Emily’s lump tripled in size and grew to 10 centimeters in both length and width. But this time, Emily pushed for a biopsy to be done, despite the radiologist’s reluctance. The biopsy revealed that Emily’s doctors were wrong. 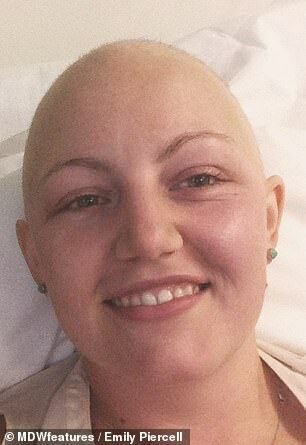 She had triple positive stage three breast cancer. 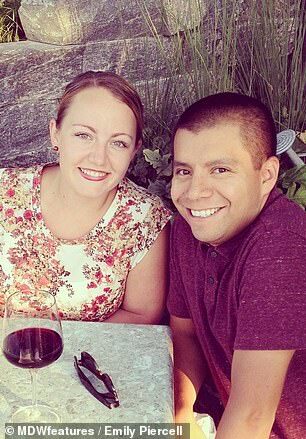 ‘I had recently changed birth control and within one cycle my hands and feet were swollen, and I noticed a large lump in my right breast,’ Emily says. In fairness to her doctors, it isn’t just that phyisicians are in the habit of turning away young women who might have breast cancer – there currently are no reliable screening tools for breast cancer in people under 40. ‘Over the next three months, my lump tripled in size and took up my entire breast. It was 10 by 10 centimeters by this point,’ Emily says. Again, Emily’s mass just looked like dense tissue on the ultrasound. 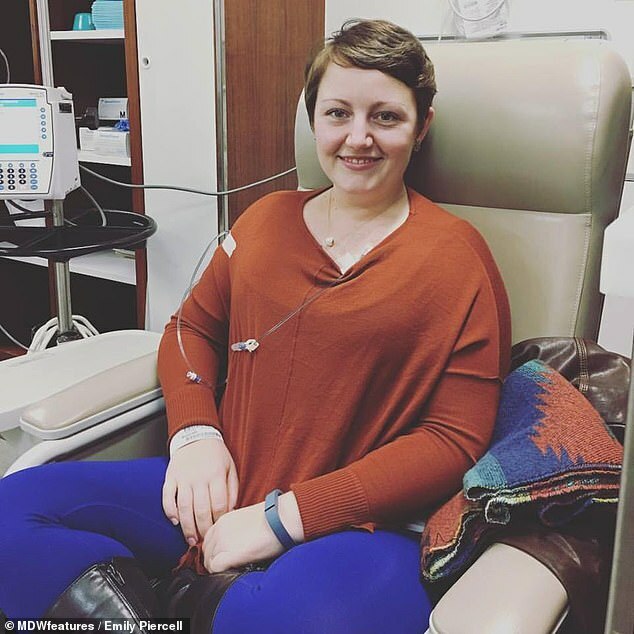 Hers was particularly unusual not only because Emily was so young, but because she didn’t seem to have non-clinical warning signs that she could develop breast cancer early, like a family history. But it’s actually a bit of a myth that family history is predictive of breast cancer. Emily was right. The mass was cancerous, and had reached the third stage – progression that was not helped by the delay in her treatment. ‘By the time I eventually received my breast cancer diagnosis, we knew the cancer had spread to my lymph nodes,’ said Emily. ‘Treatment was really difficult. I was nauseous, weak, moody, had bone pain and mouth sores,’ Emily said. 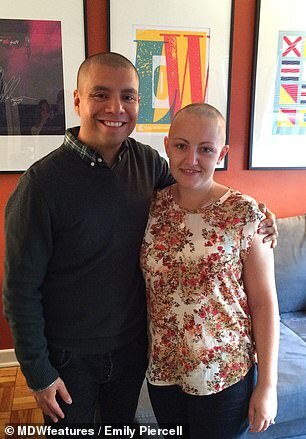 ‘At the time of my mastectomy, after chemotherapy, there was still cancer in three lymph nodes,’ Emily said. But because of the wait, she would have to have all the tissue removed – and have the same done in the other breast, to be safe. ‘Losing my breasts felt like I lost a limb and a part of myself. 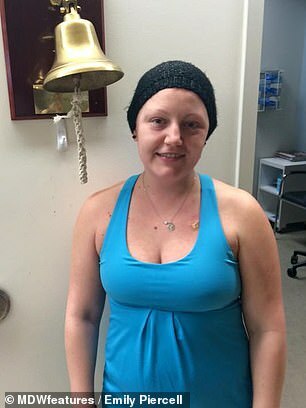 I was so scared to be done with chemotherapy and move onto surgery,’ Emily said. The group didn’t have any legal positions available at the time, but they said they could use her help elsewhere in the meantime. ‘Legal work didn’t make me feel good in the way that what I’m doing now does. I think I’m where I’m supposed to be,’ Emily said. ‘Some days I’m still hard on myself about not being a lawyer because I worked hard to be one, but I have different priorities now. ‘My career has changed, and I have dedicated my life to helping other young women who are dealing with cancer.